Anders Frederik Steen makes wine from “grapes and only grapes”. 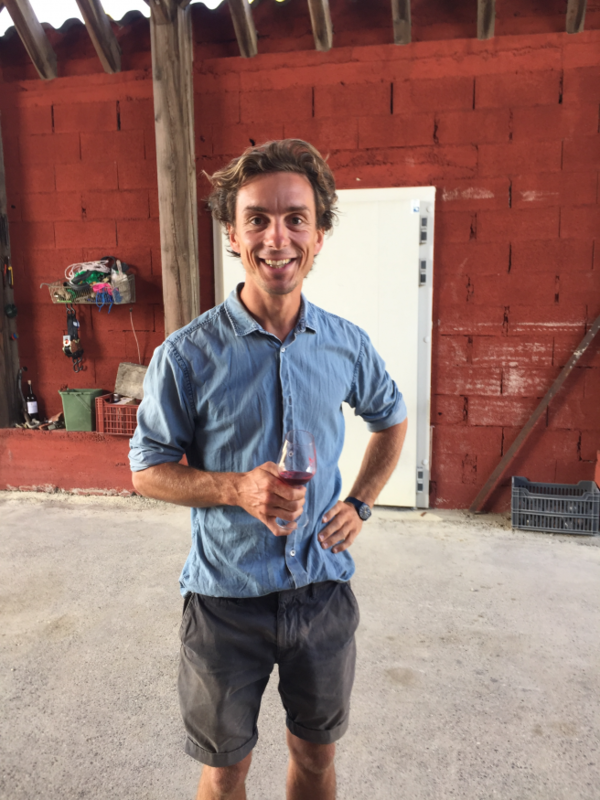 He’s been doing this since 2013 when he first started buying fruit from winemakers he admired and making wine alongside legendary Jura vigneron, Jean-Marc Brignot. Anders and his family have now settled in the beautiful village of Valvignères in the Ardèche and he grows grapes and makes wine at his friends Jocelyne & Gérald Oustric’s farm, Le Mazel. It is a beautiful spot on the slope of this wide, open valley and the many varieties grown here thrive on a perfect mix of clay and limestone. The vineyards are full of life, having been tended organically for decades. In his previous life Anders was both a chef and sommelier, working at the best restaurants in his native Denmark. First as a sommelier at Noma, later opening Manfreds and Relae. This experience informs his winemaking in that he does not seek to follow rules and doesn’t feel the need to do the same thing every year. Instead, as he harvests he tastes the grapes and begins to imagine the kind of wine he might be able to make. It is a refreshingly logical, creative approach and the results speak for themselves. Anders’ wines are made from red grapes which are either pressed directly or destemmed by hand and white grapes pressed directly in a beautiful old wooden press. Any blending is done during the harvest and the different varieties always ferment together, spontaneously, outside under the open sky. The wines are bottled unfiltered, with no additions and are thoughtful, original expressions of this part of the Ardèche. A equal blend of a direct press of Cabernet Sauvignon and a mix of Carignan and Grenache Noir that is destemmed and spends 10 days on skins. The wine is aged in fibreglass vats and was bottled in May. From last year’s releases, this is incredibly open and expressive. Defined by it’s gorgeous, lifted aromatics and pure juice, it’s everything we love about wine from the Ardèche. A blend of 40% Sauvignon Blanc, which is given a direct press and 20% each of Carignan, Syrah and Grenache Noir. The red grapes were destemmed and placed in cuve, then the white juice, which had already been fermenting for around two weeks was poured over the top. After two weeks it was all pressed off and then aged outside in fibreglass until July. A beautiful wine to both sniff and drink, what struck us about all the 2016’s from Anders was their purity of fruit and this is a great example in every sense. A blend of 40% Carignan, 40% Viognier and 20% Chardonnay. The Carignan is destemmed and the whole berries ferment in the juice of the whites and aged in fibreglass until July. Light, bright and nimble, it is perhaps the most immediate of these wines a true wine of thirst that is just impossible to put down. 50% Carignan, 20% Syrah and 30% Grenache. The grapes were destemmed by hand, and spent three weeks on the skins before being pressed, aged in old barriques until June and bottled in magnum. Like many of the 2016’s, this has a savoury, almost salty character to the fruit that just makes for an incredibly appetising wine. From a beautiful harvest of Carignan. This is destemmed by hand and spent one week on skins before being loaded into the old vertical press. This is just the free run juice, aged in old barriques until June. One of the purest wines we have tried in a long time, a real pleasure to drink. A magnum is most certainly required. Carignan destemmed by hand, it spends one week on skins before pressing, this is the from the same grapes as ‘I would write a love song…’ but here the juice is from after the grapes are given a gentle press. As you would expect, this is a little more structured and savoury. A beautiful expression of Carignan.